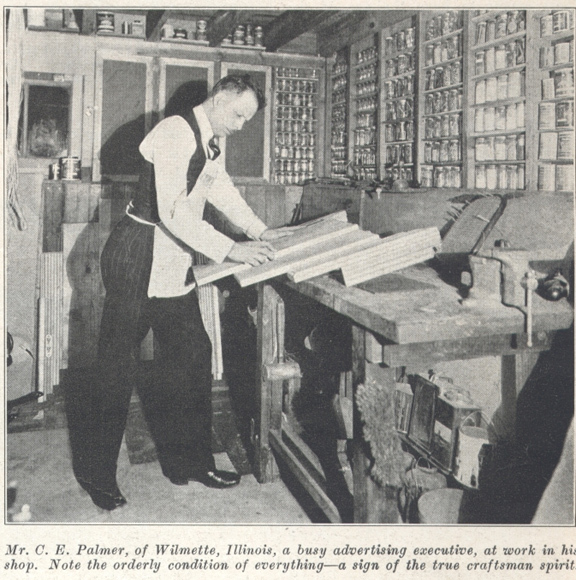 Document 41: Popular Homecraft volume 1, number 1, 1930 "The Growing Popularity of Homecraft Workshops"
1. 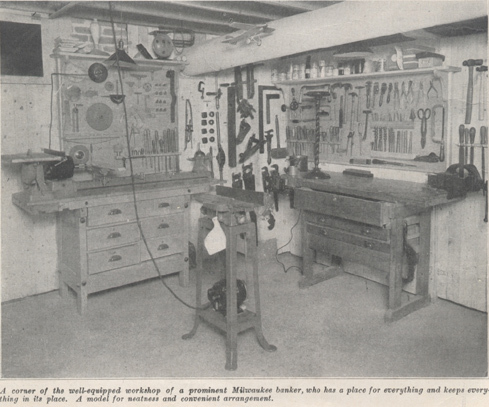 It is in the first article in a newly launched periodical in America directed primarily toward home workshops, with considerable proportion of its pages dedicated to woodworking. Recent figures indicate that more than 77,000 power-driven home-workshop outfits are being operated in the United States alone, and the number is constantly growing. Today he has an electric motor in his little shop and a complete outfit of power-driven tools ... today, manufacturers have made it possible to install such power-driven tools at very moderate cost. For the fellowship of the home-crafter is broad and democratic. It embraces men and women of all ages and of all degrees of well being, from the very moderately circumstanced to the affluent and distinguished—all who have the creative and constructive instinct, who like to "make things" with their own hands. THERE is indeed profound wisdom in the saying of the late President Eliot, of Harvard University, that no one is fully educated unless to the cultivation of the mind he has added the sharpening of of the senses and the training of the hands. Recent figures indicate that more than 77,000 power-driven home- workshop outfits are being operated in the United States alone, and the number is constantly growing. It would be interesting if we could trace these outfits to their various destinations all over the country and see just how they are being used. It would be even more interesting to sit down with their owners and hear from their own lips what dividends of pleasure, satisfaction, steadied nerves, and general well-being they have received merely as by-products of their fascinating hobbies, to say nothing of the actual articles, useful and numerous, which they have created. There would be many surprises. Our quest would take us into many and varied places—into obscure little villages tucked among the hills of the South, out to lone, prairie farm-homes, into grimy industrial cities, and out to the fine suburban estates of wealthy business and professional men. There are, of course, countless thousands of "hobbyists" who enjoy working with the more fundamental tools—to whom a power-driven lathe or a table saw is still a mystery. But from their ranks are annually being recruited many who come to love the "z-z-zing" of a circular saw as it eats its way through the fresh, clean wood, or the pungent smell of a smoking steel chip as it curls up in a spiral over the lathe tool. The mere fact that they have handled tools of any sort and acquired the true craftsman spirit of keeping a fine edge and working with painstaking precision, has prepared them for the greatly multiplied possibilities of a power-driven outfit. Thus, for example, a distinguished college professor who is equally proficient as a photographer, a wood-turner, and a commentator on the plays of the immortal Shakespeare, began with a rather meager set of the very simplest tools. Gradually, as his hand acquired more skill and his interest quickened, he added to his equipment. 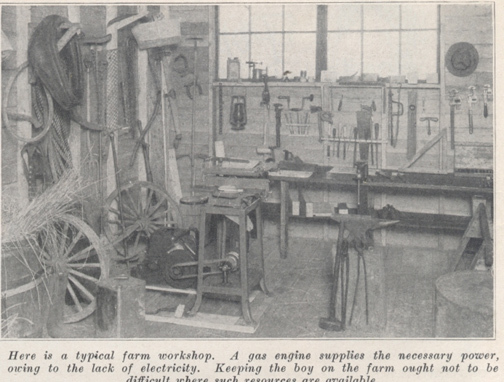 Today he has an electric motor in his little shop and a complete outfit of power-driven tools, and the tea-carts and other articles of furniture he turns out and presents to his friends are the pride of all who are lucky enough to receive them. This example could be multiplied many times over. And fortunately, today, manufacturers have made it possible to install such power-driven tools at very moderate cost. They have designed combination outfits of power-driven wood-working and metal-working tools especially for the use of the homecrafter. In some cases these tools can be acquired a unit at a time until the full outfit is obtained. In others, convenient terms have been arranged, so that it is now possible for the man of modest means to have the use of the full combination while he is paying for it, just as in the case of the radio or the automobile. There is no question that home-crafting is growing by leaps and bounds. It has always been a popular form of recreation abroad, especially in Germany and England. And it is fast becoming popular not only in this country, but also in Canada and Mexico. Bankers, lawyers, doctors, college professors, ministers, business men. and other "head-workers" are enrolled among its most enthusiastic followers. Farmers and manual workers of all types form a goodly army in themselves. School-boys, and even school-girls, find in it an absorbing and fascinating pastime, much to the relief of countless wise parents. To a great many homecrafters their abilities to produce useful and attractive pieces of work have gradually put them into profitable and growing business enterprises that had their foundation in merely "tinkering around." As an emergency or supplementary means of adding to the personal income, thousands of others have demonstrated the value of homecrafting beyond a mere avocation. If you can find a corner in your basement, attic, or unoccupied space in your garage for a workshop, try out the Homecraft idea. Every member of the family will eventually enjoy it. And they can have no better recreation.